Need to Vent! 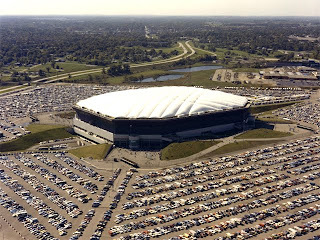 — Movie Reviews with a Twist: PONTIAC SILVERDOME -- The Deal Of The Century? 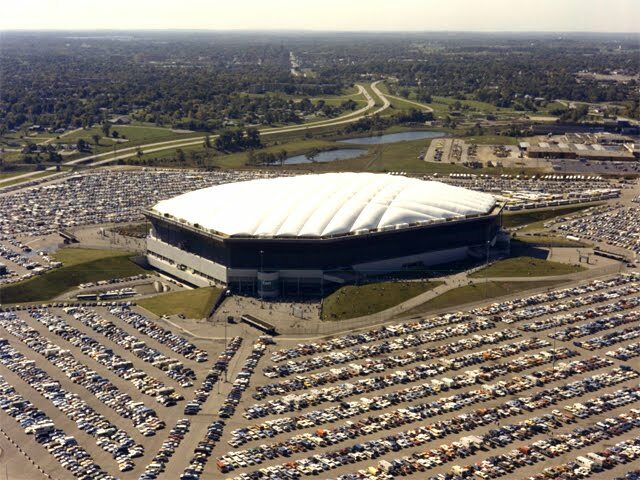 Yesterday the Pontiac Silverdome was sold at auction. When completed in 1975, at a cost of $55.7 million (the equivalent of around $70 million today), it was the largest stadium in the National Football League, with seating for 80,368 loyal Detroit Lions fans. And every seat was indoor thanks to the 10-acre Teflon coated fiberglass roof supported by no less that 1,700 tons of structural steel. That's not a typo. The selling price was a mere Five Hundred Eighty Three Thousand Dollars. This amount is virtually the same as the asking price for the luxury high-rise condominium I was recently looking at in downtown San Antonio. I was told that this was a bargain the likes of which I would never, ever see again. When I broached my semi-trusty Century 21 agent about the purchase price of the Silverdome he found the news so shocking it turned his sports coat a hideous yellow vomit color. Oh wait, it was already that way. But, now his face was just a half-shade off to match his jacket. Oh yes, the purchase of the Silverdome includes 132 acres of land. The Luxury Condo does not include any land whatsoever. To be totally fair, my refrigerator now sports a Century 21 Refrigerator Magnet -- a gift given to me even though I have not made a purchase. I also have a Century 21 Key Chain. How can they afford such largesse? All kidding aside, there obviously is no comparison. But is bigger really better? Way to critical of a team that has one a game and gives fans heart attacks and entertainment in ways no sane pro footall fan would believe. Hey and let's not forget it is in Detroit where they have to have floor warmers in the bathrooms so your feet don't cramp up. Great to live in a place like that and the price is very affordable. I was impacted when I visited Dallas , the Cowboy stadium is unbelievable , I am not that it is not related with you were posted , but I want to said it about Dallas !